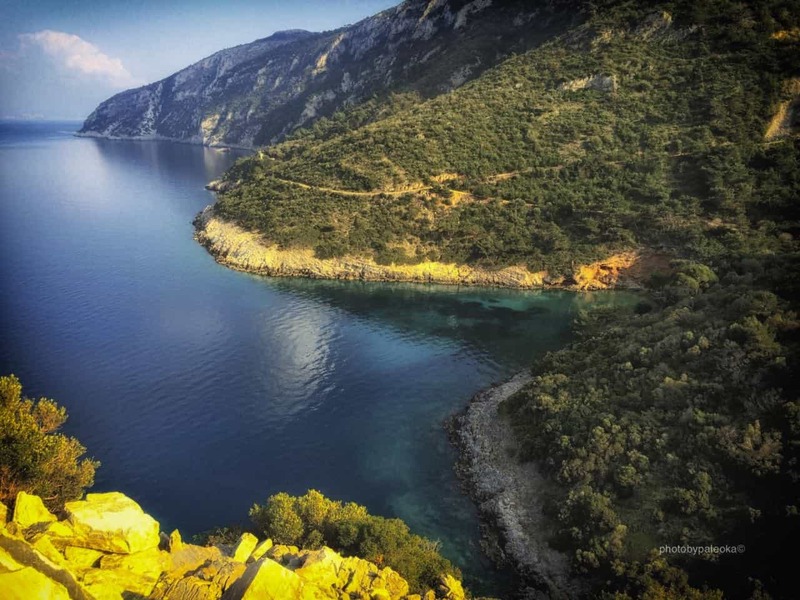 Samos Island lies on the eastern part of Greece midway between North and South. It is a quite large island and to visit you will need more than a few days. The first thing is the striking scenery. Everywhere around everything is Green. 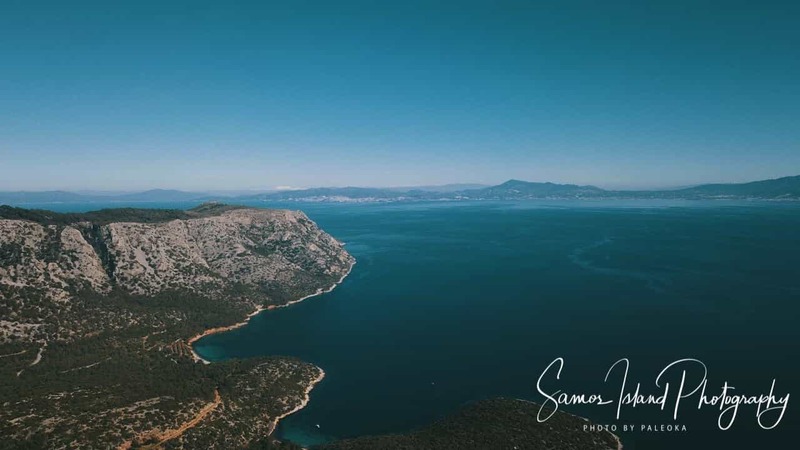 The vegetation on Samos is one of the highest if not the highest among the Greek Islands. You will find fresh water springs here, waterfalls to swim in, forests that you can lose yourself in. 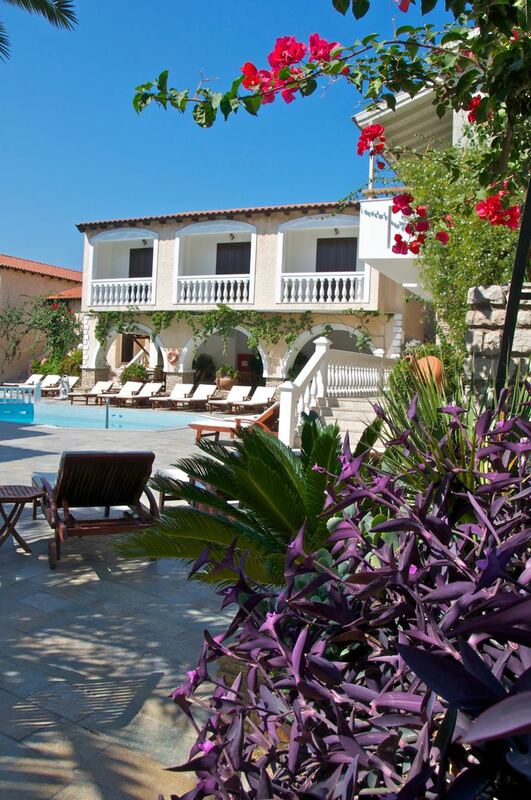 This subtropical environment is harmonically combined with the majestic Aegean Sea. The Turquoise Waters are in balance with the pebble and sandy beaches of the island. 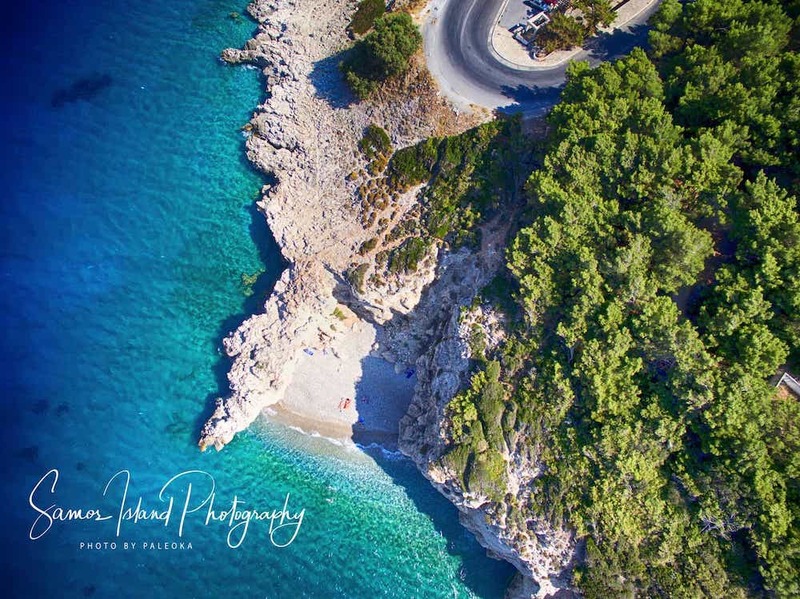 After Several Years living and working here We counted more than 300 beaches or secluded small bays that swimming is easy or let's just say a must. You can literraly take a swim anywhere on the island. There are sandy beaches, peeble beaches, small bays, cliffs. My favorite quick swim on Samos was always the cliff diving. One of my favourite places which will cover later on is the coast between Avlakia and Tsambou Beach on the North. Breakfast at Ino Village Hotel and Off we GO!!! We suggest you wake up early in the monring to start with a nice breakfast at Ino Village Hotel and then Spring into action! We make a right on the exit of the hotel and follow the sign to "Nisi" . The Road is narrow so please be careful. The Scenery is amazing overlooking the north side to Kokkari Village and Avlakia. 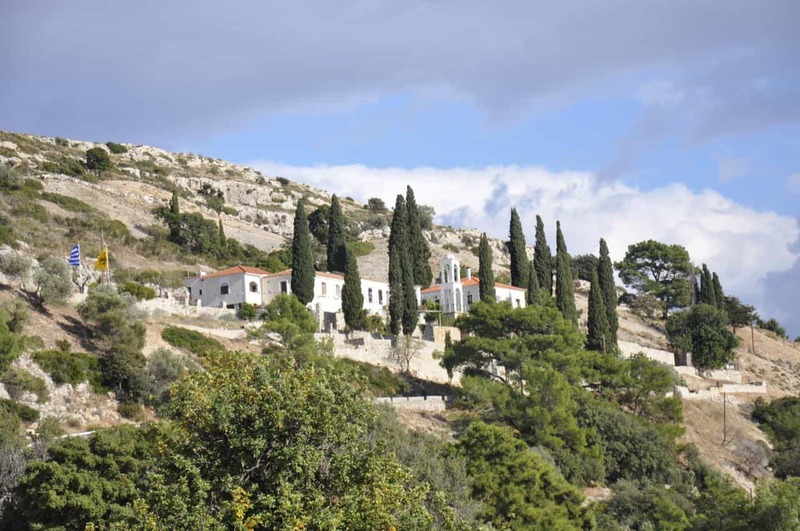 Driving for About 6 km we Reach the northern tip of the island the secluded Monastery of Panagia Kotsika. 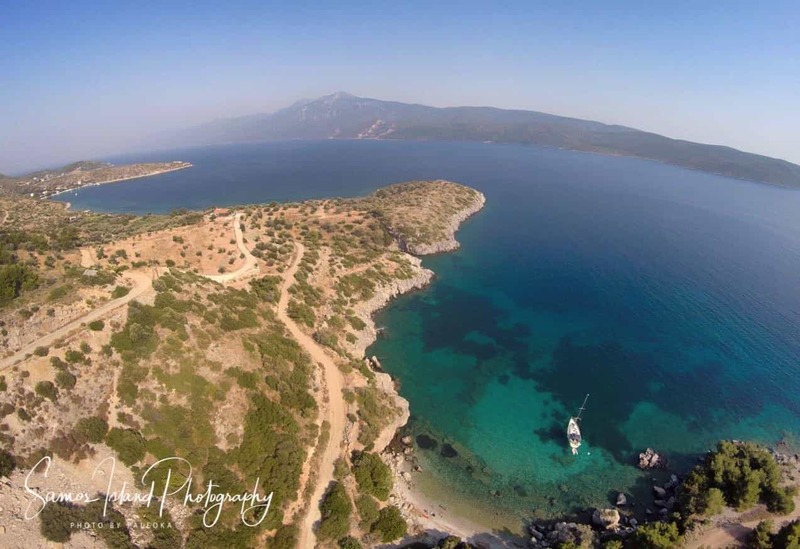 After a small stopover to admire the View towrards the small insel of Agios Nikolaos we continue towards Livadaki Beach. There you can find a lovely beach bar. The beach itself looks like a tropical haven on the edge of a steep cliff. In the morning it usually is very calm, the waters are clear and the beach is sandy. You can have your beach bed in the water and enjoy your coffee. Seriously you cannot make this stuff up. Amazing place, hands down. After 3 pm it attracts more people. On the weekends is very busy, especially in July and August. If you like partying during weekends there are resident DJ's and nice cocktail parties with dance music. 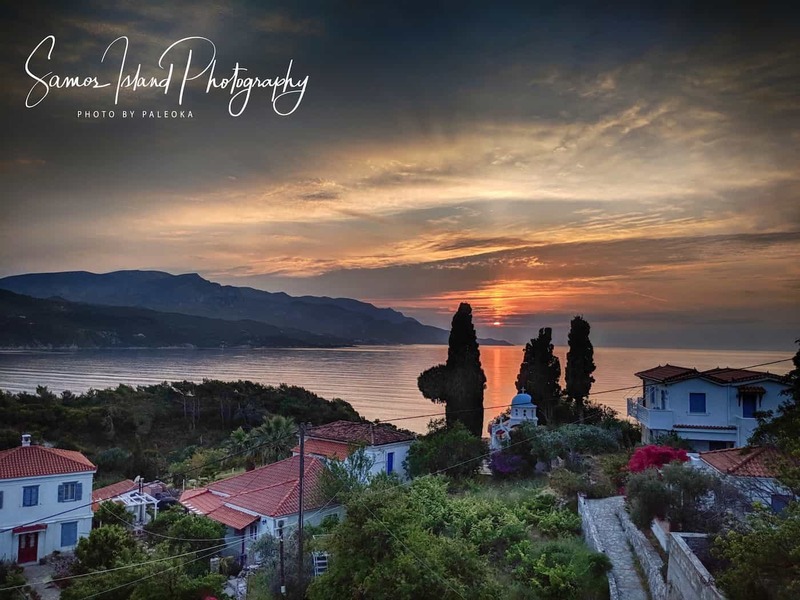 A couple of Kilometers of dirt road and then to the north is the small settlement of Agia Paraskevi also called Nisi by the locals. 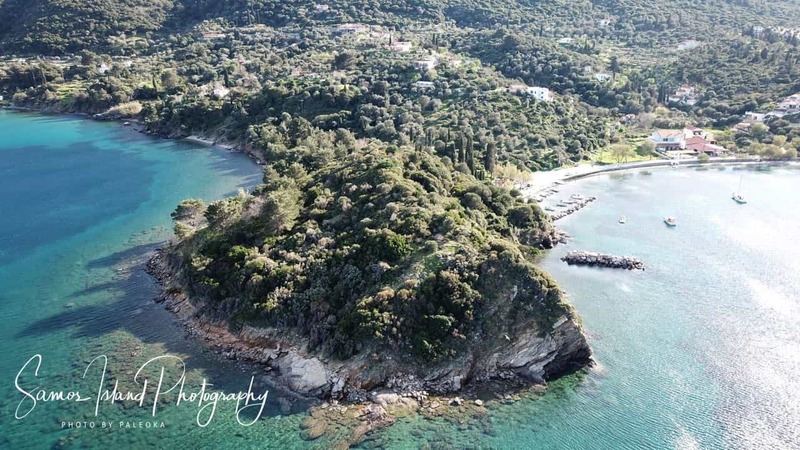 A nice serene bay with a small beach and a couple of Restaurants serving Greek Food. Widely popular between Greeks, used to be the summer resort for the Town people. The Samos Town People. I know it sounds silly but Samos Town was for work and places like Nisi was only for relaxing ... Greek Style. I.e. Wine or ouzo drinkng all day, shallow waters for the kids to enjoy their swim, and friends and family gatherings which would last all weekend. 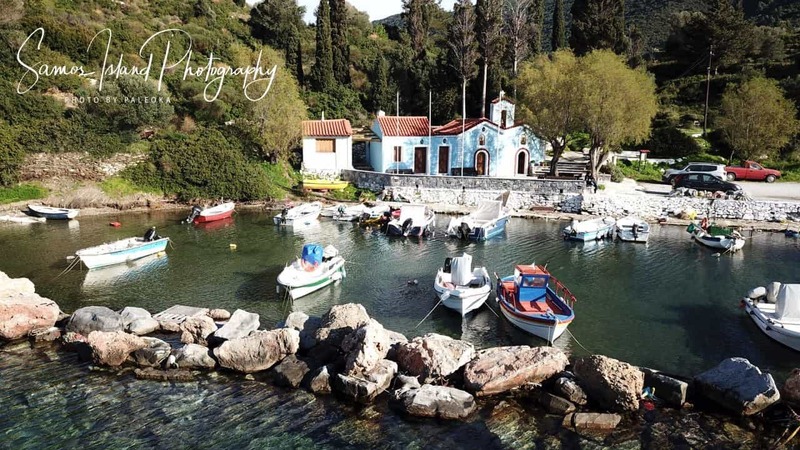 On the edge of the bay is a cosy chapel of Agia Paraskevi, and in front is a fishing boat shelter. There is also a festival there with wine and the traditional "giorti" which is a delicacy for the Samians. Giorti is made on a gigantic pot with flour, chickpeas and goat meat, each year on the 26th of July. About a kilometer to the east we find the Beach of Galazio. One of my favourites. Secluded, suitable to spend the whole day beiing lazy, read a book and constantly taking a dive. That it because of the natural shade that is formed by the trees which are literaly on the beach. No mobile phone signal there, pack enough water and snacks. Snorkling is also a great option, make sure to fit a buoy. To the east the scenery gets wild, its only dirt road, a Jeep or similar car is essential. A couple of kilometers on this road you reach Arkoudolaka. A magical place that leads to the Sea, There is a small bay there and one can only admire the mountain range leading straight to the sea. The area is a lush pine forest and olives trees. No beaches here, but a swim on the cliffs is a must for those who dare of course. A few hundred meters further ahead is the chapel of Agios Antonios. 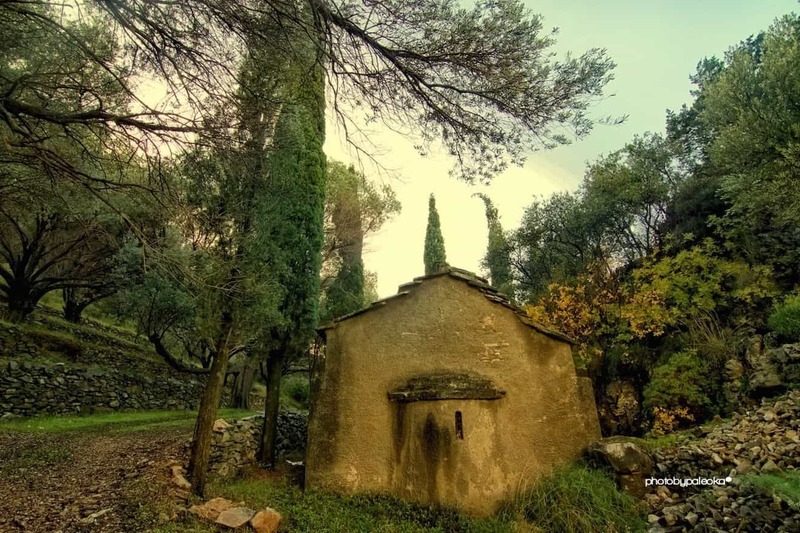 Build entirely out of Stone (even the roof), the chapel sits in the forest and the olive groves. This is one of the most quiet and secluded places on the Island. Moving South, The dirt road eventually stops and a proper road is ahead. Passing the Settlement of Kamara you turn left towards the Monastery of Zoodochos Pigi. One of the Largest Christian Orthodox Monasteries on Samos. Still active with nuns and Service. The View from the Monestery to the Southeast and the Turkish coast is breathtaking. 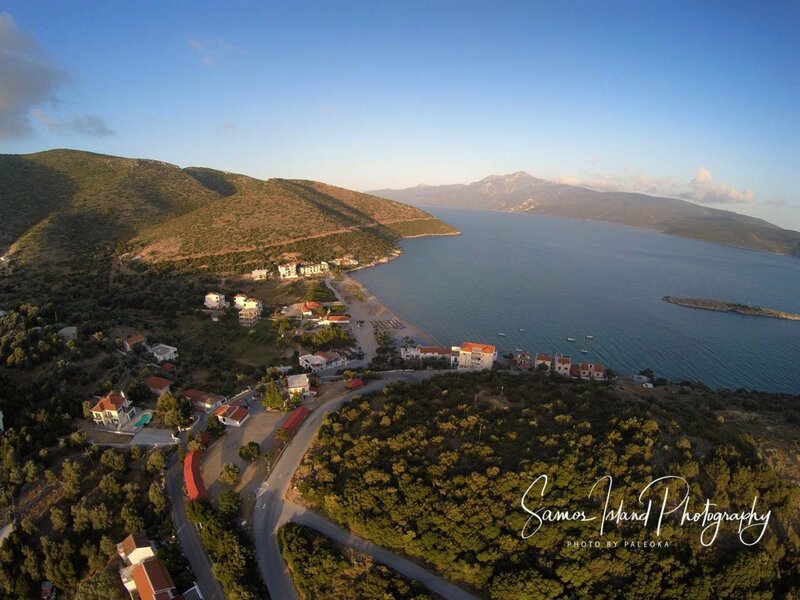 Driving Down from the Monastery you turn left on the crossroad and a couple of hundred meters you find the serene bay of Mourtia. Mourtia - famous to the locals especially the residents of the capital Samos Town - Due to its calmenss its ideal for fishing boats and small speed boats. People also enjoy their Swim there. There is no shop or beach bar in this area. Its still untouched by time. Leaving Mourtia Beach you drive to Vlamari Settlement and then turn right towrards the Village of Palaiokastro. 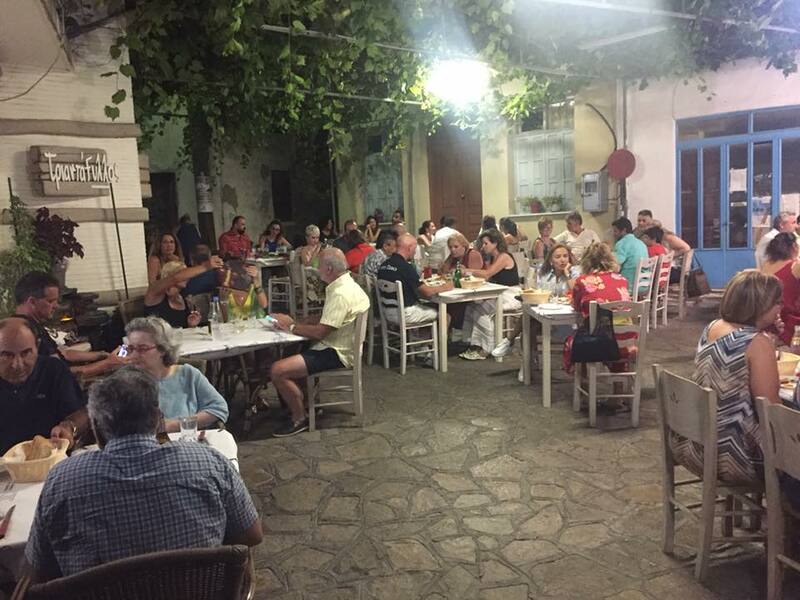 In the center of the Village in the little sqaure you find Taverna Triandafylos, which specialises in Sea Food. 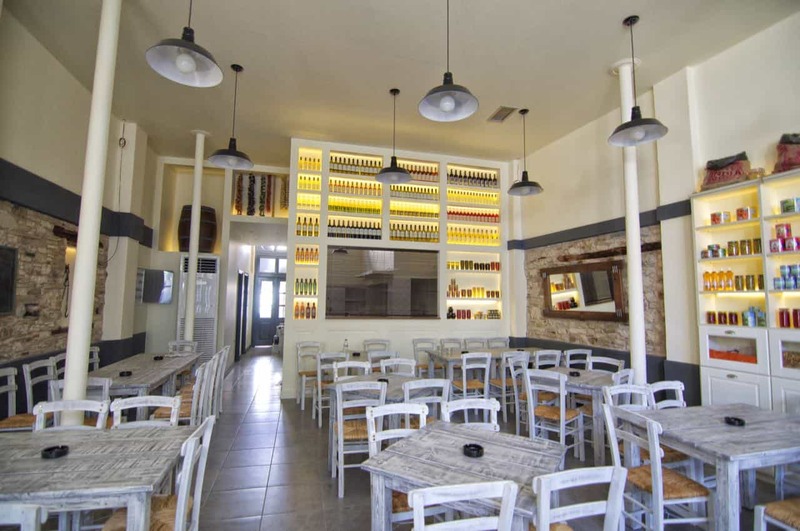 Triandafylos is one of the most popular tavernas in Samos. Open almost all year round it has internal and external space for guests. In the Summertime the little traditional square is filled with talbes. You should definately try the Tuna, the traditional Revithokeftedes, the Fresh Kalamari and the big Greek Salad. From July until Early September is Essential to Book a table at least a couple of days prior, its that busy ! Moving east away from the Village of Palaiokastro, about 6 kilometers lies the serene Beach of Kerveli. Also named Xaravgi on some maps, Kerveli is a very calm bay overlooking the Turkish Coast. The water has a sandy golden texture and the beach has tall trees and small pebbles. There are a couple of tavernas with good food there. Favourite beach among the locals, its a beach very child friendly due to the shadow of the trees and due to the fact that the waters are relatively shallow. 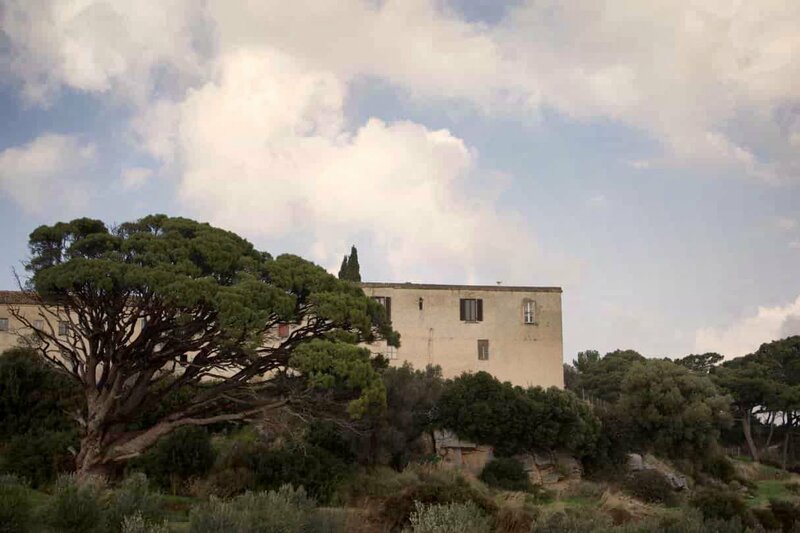 The area is competely surrounded by pine forest and olive groves. 5 Kilometers South of Kerveli lies the Settlement of Poseidonio, one of the closest destinations to the Turkish Coast. The View is breathtaking and the beach is practiacally always serene and calm. There is a famous restaurant on the seafront, which specilieses on Sea food. Famous Destination for Speed Boats and Yauchts. Poseidonio is always a great choice during summeritme. 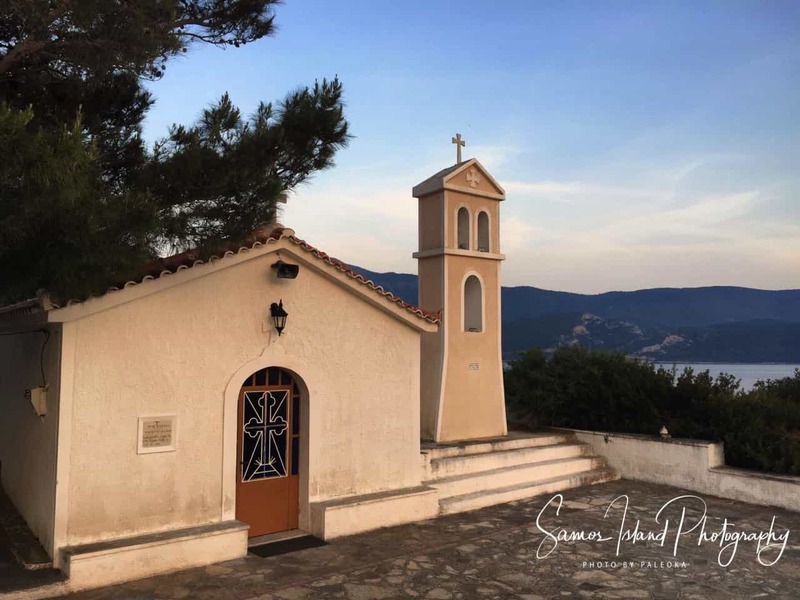 At the end of the bay lies the chapel of Agios Nikolaos. A great Spot for Photos and to calm down. The drive to the chapel is through a lush pine forest, the road is not so good, so attention is required. Moving West from Poseidonio a couple of kilometers, we stop at the settlement of Klima. 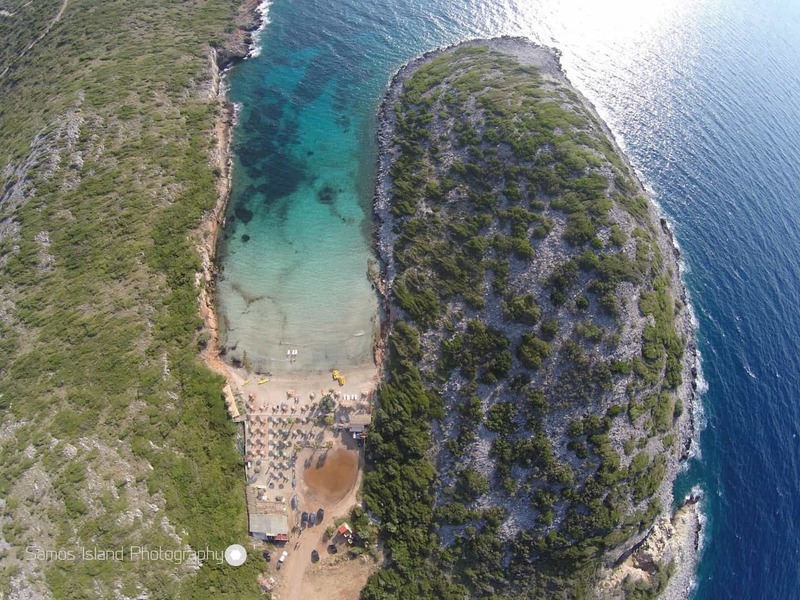 Klima is one of the nicest and famous beaches of the east side. Again, calm most of the time, a great playground for kids and a couole of seaside tavernas with great Samian Food. From Klima to the west towards Psili Ammos Beach there is difficult dirt road route, the view is amazing but you have to be extra careful since the terrain is very steep. 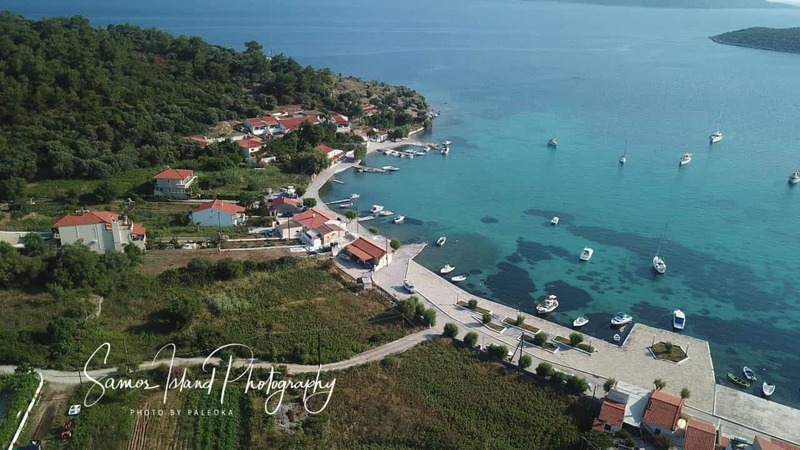 Halfway between Klima and Psili Ammos was an ancient harbor that was loading stone, there is a small pebble beach, the area is called Mertziki. It is one of the nicest and calm areas of the island. The beach it self is small but the waters are extra clean and there are hardly any waves. You feel like you are in a time capsule. 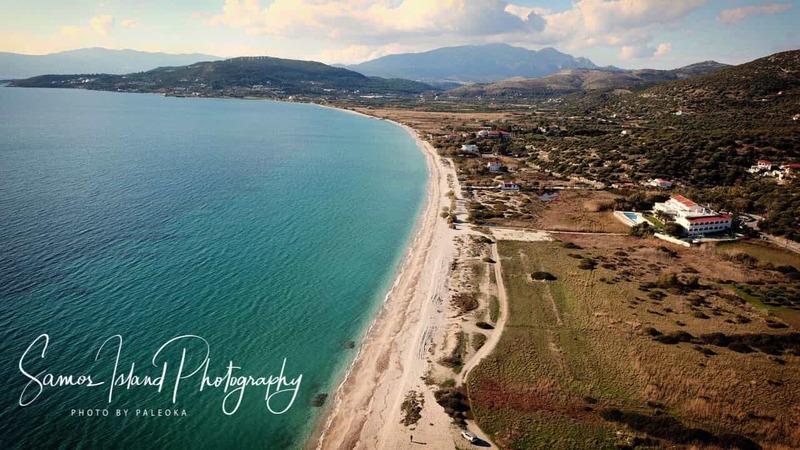 Psili Ammos is Probably the most famous Beach alongside Tsamadou on Samos. Sandy Beach with a few tavernas that sepcialises in Sea Food. The beach is very child friendly since it has very shallow waters and feels like a bath tub or a shallow pool. Amazing for parents with toddlers. A great place to spend a summer's day. The Restaruant on the beach is always very busy and quite famous. The Flamingo Salt Plains is a natural preserved area. The Salt plains dry in the summer but in the winter is a vibrant water ecosystem. The flamingos migrate here to spend the winter. February - March Each year. 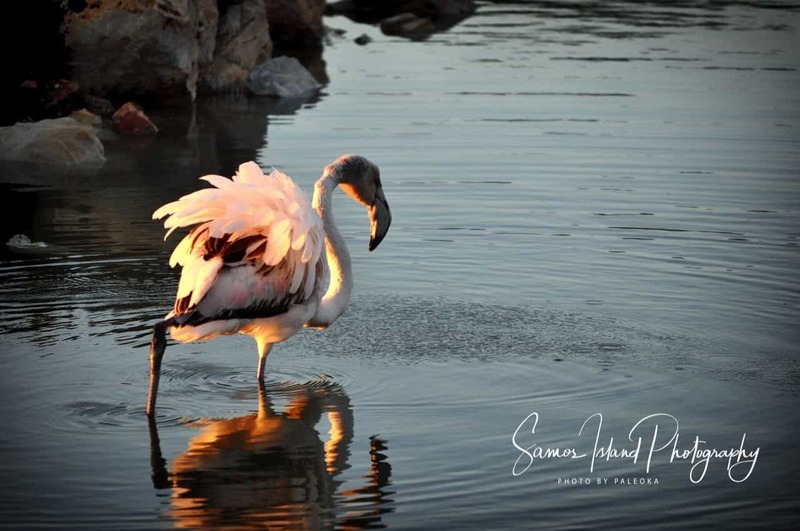 The area is just a few dozen meters from the coast of Mykali Beach, it is a great place for birdwatching, since there are many other bird species apart form the spectacular flamingos. In the plains You can still see the old salt refining building. The area is distinctive of the versatilty of the flaura and fauna that exists on the island. The Greek Goverment has marked the territory as a no building zone preserving its character. 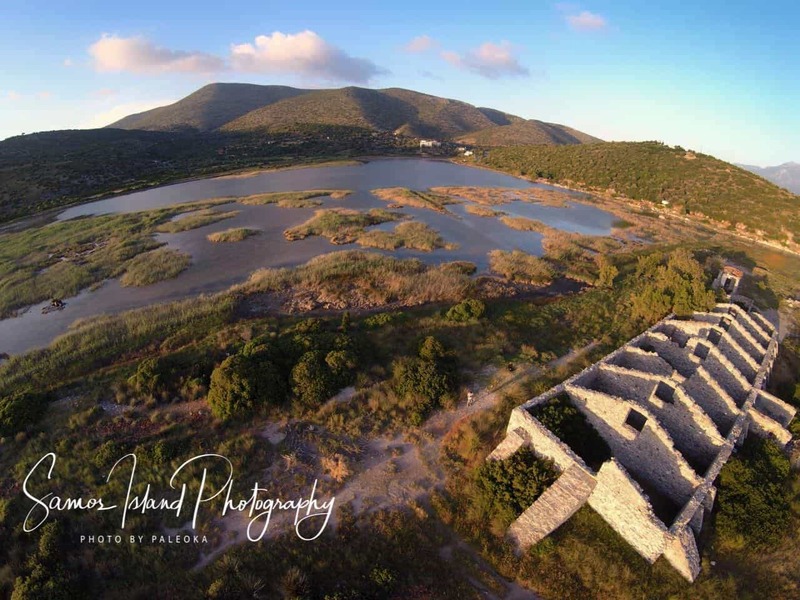 There are thoughs of restoring just the old salt refinary to be used by guests and tourists as a bird watching outpost. Moving to The West lies the great Mykali Beach. The second Largest in Samos spans for 6 kilometers. The Beach is relatively shallow and sandy and mostly calm. Highly Popular among Tourists and locals alike, is a holiday area with several medium size hotels. The road is decent and there are several beach bars and tavernas. Driving to the West, we turn right at the junction after the gas station of Mesokampos heading to the Village of Mitilinioi. 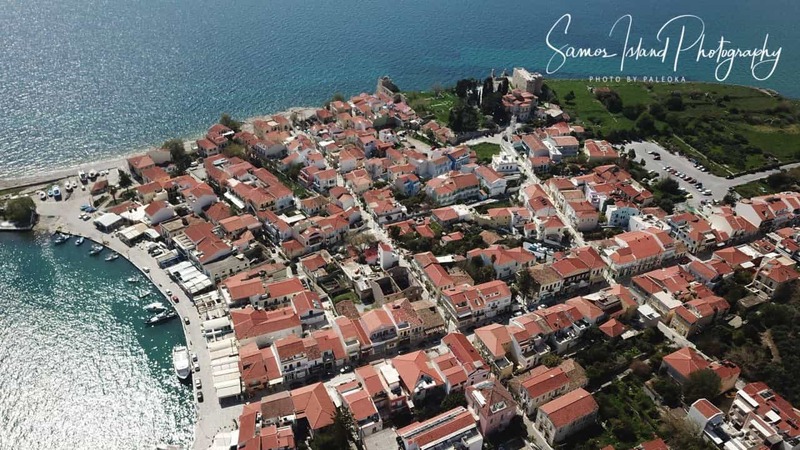 Mitilinioi is the largest village on Samos with almost 3000 inhabidants. The traditional square of the village is home to several tavernas and happenings during the summer months. Our top choice for food there is "To magazaki pou legame" a great Greek food restaurant that is open throughout the year. You should definately try the Pork Stew, the Meat Pies, The Salad and the stuffed Mushrooms. Continuing West after the brilliant Arcaelogical museum in Pythagoreio, we take a left turn, just a few meters up the road, the sign says Efplainos Tunnel and Spiliani Monastery. Moving back to the Towards the East we find the amazing Spiliani Monastery. 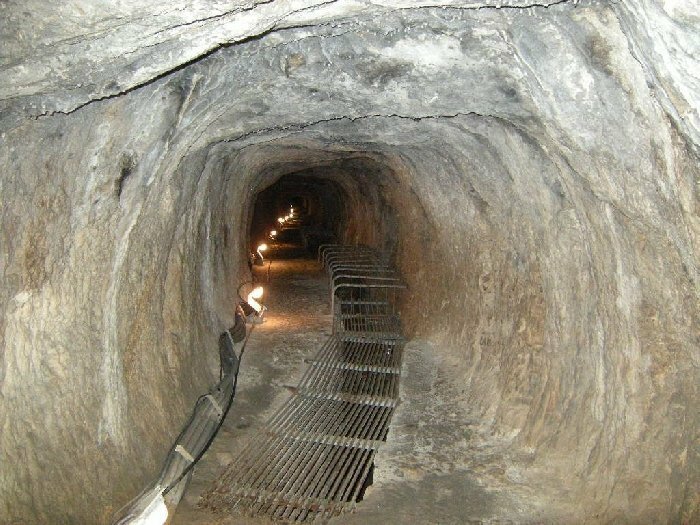 According to the Legend the picture of Virgin Mary was hidden for centuries in the mountain, and every night a light was beaming from an opening of the cave until a nearby villager paid attention and decided to go see what is going on. He digged on the place that the beam of light was coming from and he found the picture of the Virgin Mary. So the cave that picture of Virgin Mary was found became the monastery of "Spiliani" which means found in Cave in Greek. 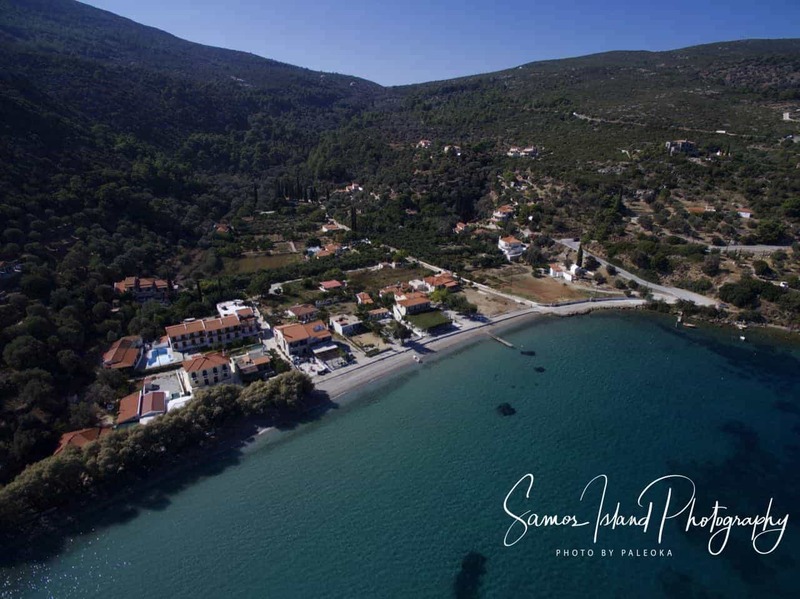 The monastery has a tremendous view to the old Samos City of Pythagoreio, the famous Potokaki Beach and Samos International Airport. Moving again to the East we land on the Ancient Samos City of Pythagorio. One of the most touristic places on Samos Pythagorio is great vibrant resort city with a beautiful harbor. 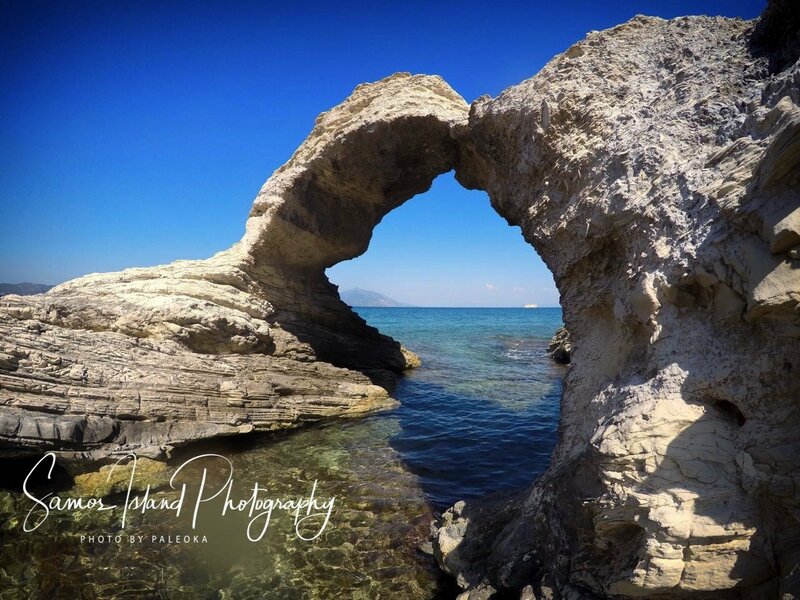 Here you can Visit the World famous Archaelogical Museum of Pythagorio, The Logothetis Castle, and have wonderful meals on Elia Restaurant, Aphrodite Garden Restaurant, or enjoy a wonderful desert at Two Spoons. 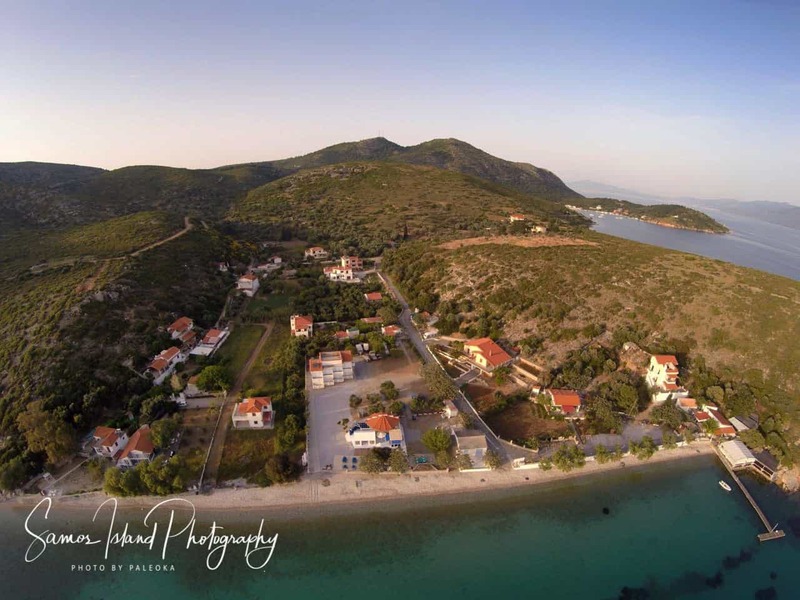 Surrounding Pythagorio there are many hotels and the 8km long Potokaki Beach, the area is filled with archealogical sites and wonderful places to eat, swim. 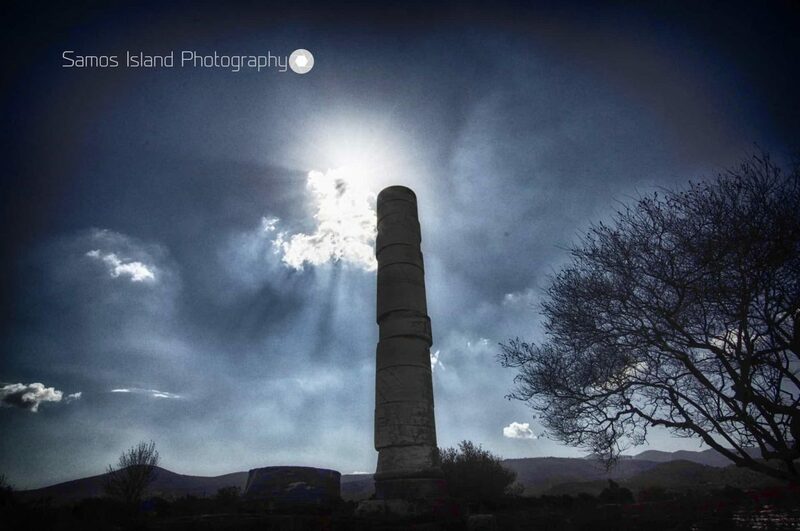 Probably the most Classic Samos Landmark is the Ancient Temple of the Godess Hera. It was the largest Hera Temple of the Ancient world and a very holy place for the Ancient Greeks. The Temple is a lagre site where you can see the development and the final demise of the site. From the orignal temple there only one Stone Pillar standing.